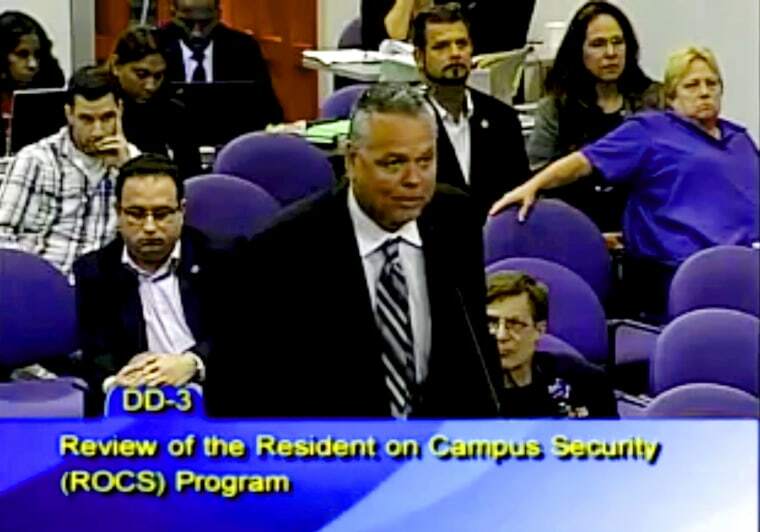 Scot Peterson, who resigned a week after the mass shooting, was accused of failing to confront the gunman. The Florida deputy who failed to confront the gun-toting teen accused in the Parkland high school massacre is now collecting a pension that works out to $104,424 a year — for life, a state official confirmed Wednesday. And relatives and representatives of the 17 people killed and 17 people wounded at the school on Valentine’s Day are appalled that taxpayers are funding Scot Peterson’s retirement. “He’s very upset that this guy, who let these kids die, is now collecting money like nothing happened,” attorney Alex Arreaza, who is representing one of the shooting survivors, Anthony Borges, 15, told NBC News on Wednesday. Peterson resigned on Feb. 22 — a week after the deadly mass shooting at Marjory Stoneman Douglas High School in Parkland, Florida — and began collecting his $8,702.35-a-month pension last month, a spokeswoman for the Florida Department of Management Services said. "He began receiving his pension in April after Broward County State Attorney Michael Satz verified that there were no charges filed against Mr. Peterson that would cause him to forfeit those benefits per Florida law," the FDMS spokeswoman, Nina Ashley, wrote in an email to NBC News. "The department will continue to monitor the ongoing investigation by the Florida Department of Law Enforcement and will continue to follow the law." Peterson was a Broward County sheriff’s deputy for 32 years, and his pension is based on the number of years he worked and the average of his five highest-paid years, The Ft. Lauderdale Sun-Sentinel, which broke the story, reported. He was paid $101,879.03 last year, which includes $75,673.72 in salary plus overtime and other compensation. His last posting was as the Parkland high school’s school resource officer. Peterson was harshly criticized after video footage from the high school revealed that he made no attempt to stop the accused gunman Nikolas Cruz, 19, from shooting up the school. Among the victims was Borges, who is credited with saving up to 20 lives when he used his body to shield his classmates and wound up being shot five times. Broward County Sheriff Scott Israel suspended Peterson after viewing the footage and President Donald Trump called Peterson’s nonresponse "disgusting" and insisted he would have charged into the school even if he was unarmed. But Peterson’s lawyer, Joseph DiRuzzi III, blasted Israel for judging his client without knowing all the facts. DiRuzzi did not immediately respond to an email request from NBC News on whether Peterson should be entitled to a taxpayer-paid pension given what happened on Feb. 14.